Yesterday, I found myself in the same old rut; perusing Facebook when Lo! and behold, my cousin Crystal posted a video saying “1 in 4 Americans unaware that earth circles sun”. I immediately thought “NO! This can’t be … I must watch this video (and hope it’s not a virus. )” To find out, IT’S TRUE!! Don’t believe me? Watch it here. Needless to say, today, I find myself inspired. Maybe I’m going to far in to science with my science posts? Maybe, I need to take a step back so everyone is on the same page – and, just in case you get stopped on the street for a science pop quiz, you will know the answer! Plus, trivia night, anyone? 1. All of the planets orbit (revolve around) the sun. (Feel free to watch the video again). Lighter objects always orbit heavier objects. This is why satellites and the moon orbit earth. Do you remember anything about Sir Isaac Newton? It was Newton who realized that the planets must orbit the sun in much the same way an object falls to the earth after we drop it. 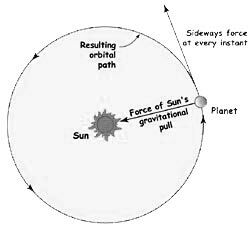 Basically, the sun’s gravity pulls on all of the planets, causing the planets to orbit it. It is also important to note that the bigger an object is, the larger it’s gravitational pull. It goes without saying that all of you know that the sun is the largest object in our solar system. NASA has some amazing resources for this subject. I should also mention that it takes 1 year for the earth to orbit the sun. 2. There is a difference between a scientific hypothesis, theory and law. And those differences aren’t what the general public seems to think they are. Let’s start at the beginning. A hypothesis is an educated guess that is based on observations. You may remember making “If … then …” statements back in middle school. If not, they kind of sound like this: If I punch my little brother, then he will cry. This statement has to be testable. In our example, I could walk up to my little brother and give him a punch. Then, I will observe the aftermath. Does he cry? What’s wonderful about a hypothesis is, you could be wrong, BUT you will get a scientific answer. In our case, my brother could cry, he could do nothing, or he might yell for mom. Our observations can change our hypothesis, to make it better, so we can get better answers. To hammer home this idea, I might be able to punch my brother 10 times with him crying each time. On the 11th try, he might punch me back! A theory summarizes a group of hypotheses made by lots of people. It’s important to re-state that these hypotheses have undergone a lot of testing and re-testing by a lot of scientists. A theory is accepted as fact as long as there is no evidence that disputes it. Once this evidence arises, the theory is not thrown out, but changed to accommodate the new observation. Basically, a theory explains why and how something happens. For example, when we talk about gravity, we use Einstein’s theory of general relativity. A law explains things, but does not describe them and it does this by generalizing a body of observations from many hypotheses that have been tested and re-tested by many scientists. A great way to distinguish a law from a theory is to see which one answers why something happens. For example, Sir Isaac Newton had a Law of Gravity. This law could predict that an object would fall, but it couldn’t tell us why it fell. For a list of 10 laws and theories everyone should at least be acquainted with, check out this article here. 3. Evolution. I was debating whether or not I should include this … as I really don’t enjoy talking about controversial things. However, everyone should at least know about it, whether you decide to believe in it or not. If you want to read more about all the intricacies of Evolution, check out Darwin’s Origin of Species (it’s even free for the Kindle App!) Many of you have heard of, and perhaps even said, the phrase “survival of the fittest!” – that’s evolution you are talking about! There are many genetic changes that can be inherited, and these small changes, over the course of time, add up to larger changes. This is why every new generation of people differs slightly from the one before it. Many of these changes have negative or neutral effects, but sometimes, there are positive ones – hence, survival of the fittest. The rate of evolution varies a lot and it depends on the organism and environment. Recently, Bill Nye (the science guy!) and Ken Ham debated evolution and creationism (see the entire debate here). When it came down to evolution and creationism, both of them said the same thing, just using different words. 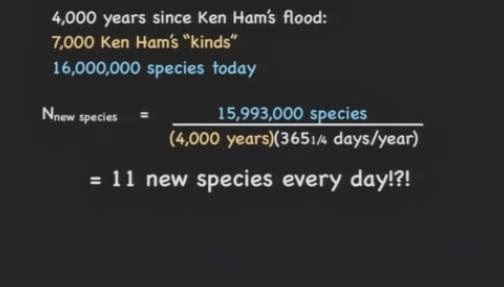 Ken Ham said Noah saved 7000 couples on his little arc, and because of that, we have all the ones we have today. I found the below picture to really hammer home the math. The picture’s link will take you to someone else’s perspective on the debate. 4. The sky is blue because of scattering. It’s not blue because it’s a reflection of the ocean waters (like what I believed when I was in elementary school). Let’s think about this. We have a sun, that we orbit around (see #1 above), and in order for that sun’s rays to reach earth, the rays have to penetrate the earth’s atmosphere. This atmosphere includes things like gas and particles that cause the sunlight to bounce (or scatter) off of them in many directions, and this sunlight is actually a lot of different colours. 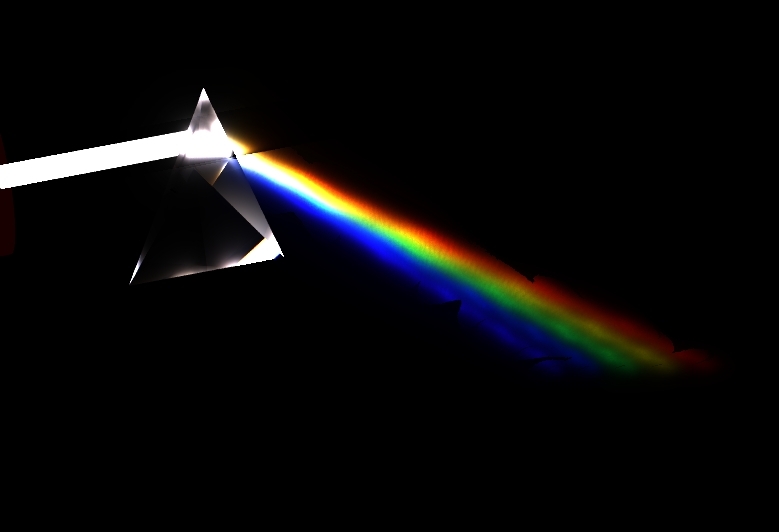 Have you ever seen a light flashing on a prism or maybe Pink Floyd’s Dark side of the moon album cover? All of the colours in sunlight have different wavelengths, with blue being very short. So, blue light can make it’s way through the “filter” (i.e. atmosphere) easier than colours with larger wavelengths, and, as a result, the blue light is scattered very widely. This is why the sky is blue when the sun is at the highest point in the sky, in relation to where you are standing. So, how do we explain the beauty of sunsets and sunrises? At these points, the sun is not above where you are standing, it’s much farther away. The sunlight has to cross a great distance to reach you, and this distance allows the blue colour to, essentially, fade away, allowing us to see the reds and oranges and yellows of the light! I think we will stick with these four things for now. If you are curious about anything, feel free to post your questions in the comments section below. Remember, we aren’t debating anything here (there are other blogs and forums for that).